Posted on 16th January 2019 by Gavin in News, Nutrition. comment(s). One of the hottest food trends of 2018 was the plant-based and vegan diet. And, with more and more supermarkets stocking vegan-friendly food, many of us will be starting to cut back on meat or wondering if we could go vegan too. 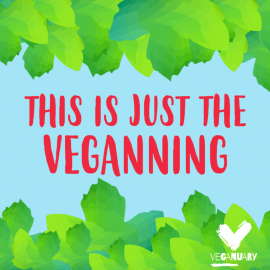 Whether you are mindful of animal welfare or the impact that the meat and dairy industry has on the environment, or you are simply thinking about your health by embracing rainbows of plants, there are many reasons to start easing back on the meat. In fact, this January will see many people across the UK trying something new as they swear off the meat, dairy and eggs and give Veganuary a go. Very few people can simply switch to a vegan diet overnight. For many, it's a long transition so, if you are thinking of switching to a plant-based diet, then consider easing back slowly. You could start with embracing Meatless Mondays, before slowly cutting back on meat, eggs and dairy. If you're feeling braver, then you could give Veganuary a go! Whatever it is you do, be kind to yourself, and remember that every little step makes a difference. Thankfully, our Rizopia pasta (made with just water and brown rice) is vegan-friendly, so you won't have to give us up! Plant-based omega-3s - you can buy omega-3s that are formed from the algae that fish feed on - for anti-inflammatory fats and to boost brain, skin and eye health. Frustratingly, most vegans will be asked, "But how do you get your protein?!" Of course, vegans don't struggle for protein - there are plenty of plant-based proteins to choose from, from tofu and tempeh to lentils, beans, quinoa and even pea or brown rice protein powders. The key is in ensuring you pack in enough protein (ideally, you want to eat protein with each meal - and you'll need more if you have an active lifestyle!) and eat each one of the essential amino acids. Complete vegan proteins are quite rare (sources include quinoa, buckwheat, soy and seitan), but when you mix certain protein sources with a wholegrain, you’re left with – voila! – a complete protein. Examples of this include peanut butter on wholegrain toast, hummus with wholegrain pitta, or rice and beans. If you're wondering whether or not you can go vegan, then set aside an hour or so and look for some inspiration on Instagram or Pinterest! There are plenty of ways to veganise your favourite meals (one of our tastiest meals is this Lentil Bolognese), so you don't need to give anything up - just make a few adjustments! Some of our favourites include blending cashews and Nutritional Yeast for a creamy, "cheesy" mac and cheese sauce, mashing chickpeas to create a tasty sandwich filling (there are plenty of recipes for chickpea "tuna!") and making silky, creamy chocolate ganache and tart by combining dark chocolate and coconut milk. Think of it like this - now is the perfect time to have fun! Be sure to try new things and to experiment with different recipes. Vegan baking can be tricky, but with a little know-how, you can make plant-based cakes and bakes in no time! Our favourite egg substitute is aquafaba (AKA the brine you find in a tin of chickpeas) – you want to use roughly 3 tbsp of aquafaba per egg needed. You can use aquafaba to make chocolate mousse, cookies, cakes, and even Pavlova! You can also try baking with chia or flax eggs (simply mix 1 tbsp of ground chia or ground flax with 3 tbsp of water and leave for 15 minutes until it has an egg-like consistency), or simply using coconut milk. In terms of vegan-friendly fats, you can use coconut oil, vegan butter or even avocados in place of your typical fats. Above all, if you are starting on a vegan journey, have fun with it and enjoy! Do you have any top tips? Share them with us by commenting below!